Just in time for Tuesday night's Republican presidential debate, NBC News is out with a story reminding everybody of just how closely the architects of Obamacare modeled their efforts on Romneycare. The story, by Michael Isikoff, cites White House records showing that three key analysts who worked on the Massachusetts reforms met with administration officials at least a dozen times. The three individuals are Jonathan Gruber, an MIT economist; Jon Kingsdale, a consultant who ran the newly created Massachusetts insurance exchange; and John McDonough, a longtime health care activist in Massachusetts who now lectures at Harvard. Of course, this is not the first time we've heard about any of these individuals working with the Obama Administration and its allies on health care reform. Gruber's role has been the subject of considerable attention and even some controversy. Kingsdale was in the news during the summer of 2009, as lawmakers drawing up the Affordable Care Act were designing the template for insurance exchanges in the new law. And McDonough? Crafting the bill that became the Affordable Care Act was his full-time job for two years. 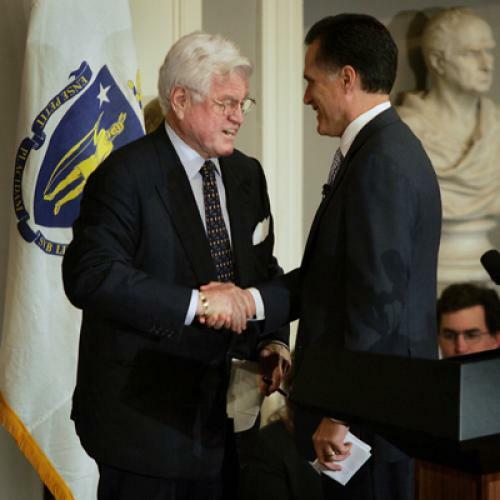 He joined the Senate Health, Education, Labor, and Pensions (HELP) Committee in the summer of 2008, at the request of then-chairman Ted Kennedy, who hoped that McDonough could help turn the Massachusetts model into a template for national reform. Remember, HELP was one of the two Senate committees that wrote the final legislation. As it happens, McDonough has just published a book on that experience called Inside National Health Reform. In it, he describes just how consciously, and closely, reformers in Washington followed the example Massachusetts had set. Among the stories he recounts is an October 2008 meeting \in the Dirksen Senate Office building. In a presentation to key "stakeholders" -- consumer advocates, lobbyists for the health care industry, and so on -- HELP staff outlined three possible approaches to reform. There was "Constitution Avenue," meaning a wholesale change to single-payer or some other new system, along with "Independence Avenue," meaning an incremental, go-slow approach to reform. And then there was "Massachusetts Avenue,"
meaning reform based on the key elements of the near-universal coverage law enacted in Massachusetts in 2006. Those elements include deep and systematic health insurance market reform, a mandate on individuals to purchase insurance, subsidies to make insurance affordable, and an insurance "exchange" to connect people with coverage. By October 2008, this approach had become the accepted direction among nearly all major Democratic officeholders who wanted health reform to be a top priority in 2009, including the three major Democratic presidential candidates. ... Before the election, before the congressional process was actively engaged, a 2006 Massachusetts law had already become the essential template for national reform. If you want to read more about the many connections between Romneycare and Obamacare, by the way, I highly recommend Brian Mooney's series in the Boston Globe and Ryan Lizza's essay in the New Yorker -- along with McDonough's book. That includes Jon Kingsdale ... Health and Human Services awarded Kingsdale a contract this year to help plan a federal health exchange, the fallback option for states that do not set up their own marketplaces by 2014. “We’ve been helping [HHS] think through operationally how it would work,” Kingsdale told me (subscription required) of his contract when we spoke about it in May. Across the the country, the role of Massachusetts’s health reform veterans is even more pronounced; the consultants now helping states implement the Affordable Care Act are a veritable Massachusetts health reform alumni club. When Kingsdale and I talked about this a few months ago, he estimated that former Massachusetts officials are now working in about 20 to 25 states on implementing the federal law. The list is long and most of the names aren’t exactly household ones outside of health policy. There’s Rosemarie Day, who served as the Massachusetts Connector’s chief operating officer for four years, who now runs an independent consulting firm, Day Health Strategies. She’s worked with Hawaii and Washington State on implementing health reform. There’s Melissa Boudreault, who directed Commonwealth Care, the insurance plan offered to low-income Massachusetts residents. She is now a vice president for mega-technology vendor CGI (which, incidentally, was awarded a $93.7 million contract to build the federal exchange, the one Kingsdale has been working on, late last week). Others have found work at top consulting firms, such as Deloitte, while some have gone to smaller health shops, like Bailit Health Purchasing and Health Management Associates.